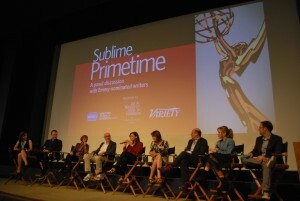 Just days away from the 67th Primetime Emmy Awards, the Writer’s Guild Theater opened its doors for a panel discussion with eight of this year’s Emmy nominated writers. Snacks and refreshments were offered at the reception, where the public socialized with the writers before the panel commenced. The panel discussion was full of insightful revelations from the eight successful writers which included Jane Anderson, Alec Berg, Joshua Brand, Semi Chellas, Stephanie Gillis, Elliot Kalan, Christine Nangle and Matthew Weiner. The moderator for the event was Cynthia Littleton, the managing editor for TV at Variety. As the head writer for The Daily Show with Jon Stewart, Elliot Kalan discussed how his writing experience was different. “It feels like there’s this writer world… we are so busy making this one show, we really don’t have time to watch or think about the outside world other than what the show we are working on is about,” says Kalan. “The daily schedule is so tight and we are trying so hard to make it as good as we can while like running on a treadmill.” Furthermore, Kalan mentioned how technology has made an impact on the TV system. “A show does not just air once then disappear anymore, you can watch it many years down the road,” he explains.